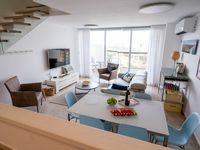 Properties in Marinali (Marina Hertslya) average 4.2 out of 5 stars. Property 36: Amazing suite in herods. Our family of four had a wonderful time here. Loved kosher kitchen, beach, location, balconies. We had a couple of issues and questions upon arrival and Amir responded right away. Apartment was clean, beautiful. Beach right across the road with a bar and available water sports right there. Private parking and a restaurant right downstairs. Walking distance to a shul and shops nearby. Highly recommended!